On my afternoon amble around Brockwell Park (yes, I ventured south of the river) I reached the lofty milestone of 25,000 steps which apparently, according to my iPhone, translates to somewhere near 20km?! I am happy to announce that my exercise for the month ahead is now complete. European equity markets also ventured south last week, as Italy’s governing coalition passed a major budget. Asset class returns in sterling and local currency are below; while equities in Europe and the Asia-Pacific region were the relative under-performers in local terms, the further decline in the euro led the continent to also hold the loser’s title in sterling terms. The key event of last week went by with very little market impact. The US Federal Reserve made the widely anticipated 25 basis point (0.25%) increase in interest rates on Wednesday, taking the official rate to 2.25%. Though this was a significant event in itself, investor focus was firmly on the accompanying press statement which saw the removal of a key phrase referring to US monetary policy as “accommodative”. This suggests the Fed is now approaching the balancing point between which monetary policy is either expansionary or contractionary thus indicating subsequent rate rises will be limited. US government bond yields fell, but less than would be expected. This can be attributed to the accompanying notes which stated the neutral rate (i.e. the balancing point) is higher than previously thought, which gives room for further increases in the Fed’s target rate. As a result of the contradictory rhetoric, the decision failed to spark any significant volatility. With US investors still trying to decipher the Fed’s cryptic messages towards week end, investors closer to home had their own event – this time actually moving markets! Italy’s governing coalition (the one that sparked a sell-off in European assets at the end of May and early June) dealt a fresh blow to bank stocks and government bond prices as it passed a spendthrift budget through its parliament. Claimed to “abolish poverty”, these plans involved guaranteeing a basic income for poor families, a series of tax cuts and reforms, and the abolishment of plans to raise the retirement age over several years. Crucially, the Five Star Movement and the Northern League agreed upon raising Italy’s budget deficit to 2.4% – still some way below the European Commission’s limit of 3% – at a time when the ratio of government debt-to-GDP sits at an eye watering 132% – second only to Greece (179%). The ensuing risk-off sentiment saw a sharp spike in Italian government bond yields and a corresponding drop in the German equivalents as investors sought safe haven assets. In the equity markets, indices across the European continent traded lower, with Italian stocks particularly hard hit. 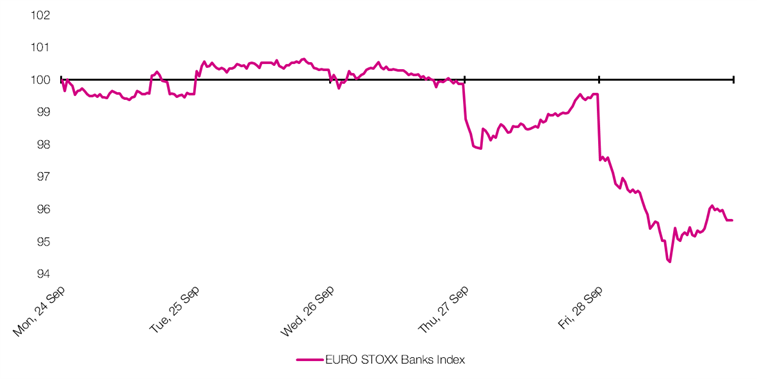 The EURO STOXX Bank index, made up of a number of banks based within the Eurozone, declined as much as -5.2% during intra-day trading on Friday, before recovering and closing just -4% on the day. Due to the high levels of public debt held by financial institutions to meet capital reserve requirements, Italian banks were particularly sensitive to falling Italian government bond prices. Indeed, trading in several Italian bank shares was actually temporarily halted to avoid prices declining too rapidly. Looking ahead, the reaction of ratings agencies and the European Commission will be key. The Italian government’s current credit rating sits not far above the minimum rating required to be classed as “investment grade. So, should the ratings agencies decide to downgrade Italy on the basis of financial instability, we could see potentially higher volatility in their bond yields. The European Commission which has the power to impose sanctions for noncompliance is due to review the Italian budget later this month, and with the Economic Affairs Commissioner already saying the plan looks like it is “out of line with our rules”, this story is far from over. STAT OF THE WEEK: 1 in 5 – the proportion of people aged 18-24 who believe that no one will be eating meat in 2030 (YouGov). Data correct as at 28/08/18.